Old Twin sisters brooch with Dove, Courting Couples 2 pc ring and small resin brooch set, 2 left and right facing lady stick pins, Blue and white Glass rose clip ons, Large rose resin brooch, Daisy Ring, Scalloped lace earrings clip ons, Porcelain Brooch with bow. The four small silver findings are marked Sterling. 8" bracelet, 18" chain 1 1/2" pendant, 3/4" pierced earrings, 1 adjustable ring. Material Gold Plated/ Shell. Weight(grams) 9.9 Grams. Stone(s) Shell. That being said, mistakes can occur. Size Shown by ruler. Antique Hand Painted Italian Woman Pin Brooch 2" T. make Supersized seem small. Get images that. Celluloid ring and resin rings, a small brooch & Ring courting couples set and a glass charm. Glass dangle brooch, Holly Hobby chain charm necklace. PIECES: 14 pieces earring pairs count as 1 set not 2. Mark: 1/20 12K GF Sterling Base. This is a very nice variety of floral brooches for your collection! The brooch with the white background has a sticker on the back that says "Russian". The brooch with the brown background can also be a pendant, and is marked 1/20 12K Gold Filled on the reverse. Clip On Earring. Pierced Earring. Glass (Pic. Ring (Size 10). ). We do not deceive. All flaws are either photographed or described or both. Excellent condition. 7 1/2" bracelet, 3/4" clip on earrings, 18" chain 1 1/2" pendant necklace. The piece is unmarked but tested good for 14k gold. Brilliant Pendant. Vintage Junk Drawer Costume Jewelry Prisms Earrings Necklace Cameo Quality Lot. Shipped with USPS Priority Mail. I don't think you will be disappointed. These pieces has has nice quality to them. These are beautiful detailed pieces. Plenty of life left in the piece from clean non-smoking estate. No Reserve. 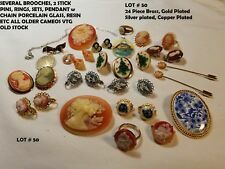 Up for bid is a beautiful Costume Jewelry estate collection. Variety of necklaces, bracelets, earrings, rings. Some Monet, Weiss, Cameo, Fresh water pearl. Just a bit of history on these. They were recently acquired from a coworker‘s uncles estate. My last two pictures gives you an idea of what I received. I have taken these off their cards. I did wash these in a ultrasonic jewelry cleaner. Antique Victorian Art Deco Vintage Jewelry Lot Rhinestones Glass, Cameos, C Clasps. These are all very wearable pieces. 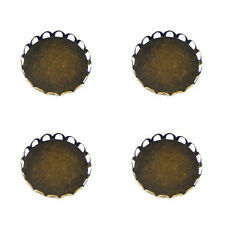 Lot features three pairs screw back earrings, and two pierced pairs. One necklace, one pendant, three Brooches, and four bracelets. VERY GOOD CONDITION. FULLER CENTER FOR HOUSING. Standard pin & catch closure. Auctions end every Sunday! Brand Name TRYON Jewelry Find unique antique & vintage Jewelry each week! Welcome to our site! We are pleased to share our wonderful jewelry finds each week with our customers. We do our best to take accurate & clear pictures. We note any major flaws in the description. Do understand everything is vintage (unless otherwise noted) and will have some form of use and wear due to age. If you have any questions or concerns, feel free to send a message through ebay's inbox. We will respond as soon as we can. We wish you all the best of luck with your bids! All auctions starting bid at $0.99! $0. TYPE: brooch with Scenery of flowers unsure if these are painted porcelain but. gold plated filigree taffy looking setting. appear to be painted on porcelain. SHAPE: Oval brooch. CONDITION: I see no defects Great shape. There are 8 necklaces, 3 brooches, 2 sets, 4 bracelets & 7 pairs of earrings. Fine jewelry is tested with a presidium gem tester and jeweler's acid. They may need to be cleaned/wiped down. Vintage Carved Shell Cameo Pendant ON 14” Ornate Chain. Shipped with USPS First Class Package. 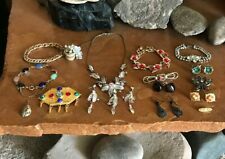 Look at this super super lot necklaces earrings THERE IS STERLING IN THIS LOT.brooches. bib necklaces. wow great rhinestone pieces.wow. trifari brooches a super nice trifari necklace strands great shape.wow. New ListingVTG Gold Tone Carved Cameo Brooch! Nice! VTG Gold Tone Carved Cameo Brooch! Nice!. Shipped with USPS First Class Package. Cameo jewelry box handmade decorative glass. Size approximately 4" x 4" and 2 1/2" tall. Mirror on bottom inside. Good condition. Looks like the chain to hold it open had been replaced at some point. Very well made. 18K YG 750 Carved Shell Cameo Pendant Large. Bale is stamped 750 for 18K. 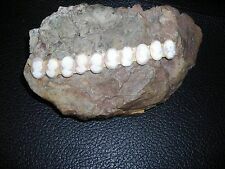 Approximately 2" total length. No damage. Shipped with USPS First Class Package. VTG Gold Tone Carved Cameo Brooch! Nice!